One of the most important activities in the organization is the relationship management. The relationship log is used by the managers (especially sales and marketing managers), to follow the relationships with the organizations Clients and suppliers, in order and to analyze it in order to learn about it and to plan the future necessary contacts. Meetings & Phone Calls - as described in the next section. The main sub-tab in this page is Meetings & Phone Calls. This tab displays all of the meetings and the phone calls related to this Client/Supplier. The "What" field describes the type of contact (Phone Call / Meeting / User Notes / System Note). At the top of this tab there are few searching fields. Use these fields to define the required filters for the search, and click on the Filter Records button. Each of the meetings with this Client / Supplier will be displayed in this table as well as the meetings abstract. Double click on the meeting record will open the meeting window. According to the meeting summary, the system allows to change the Handling Status by using the Change Handling Status button, as described below. No Answer - Use this button if there is no answer. A new phone call record will be added to the table and the "No Answer" value will be automatically filled in the "abstract" and "PhoneCall Result" fields. The system will ask the user to choose the timing for an auto reminder to call again. This timing will be automatically filled in the "Next PhoneCall On" field. These fields can be modified by the user. Left a Message - Use this button when leaving a message to the Client / Supplier. This button will create a new phone call record. Fill in the Abstract field with a short description of the message. 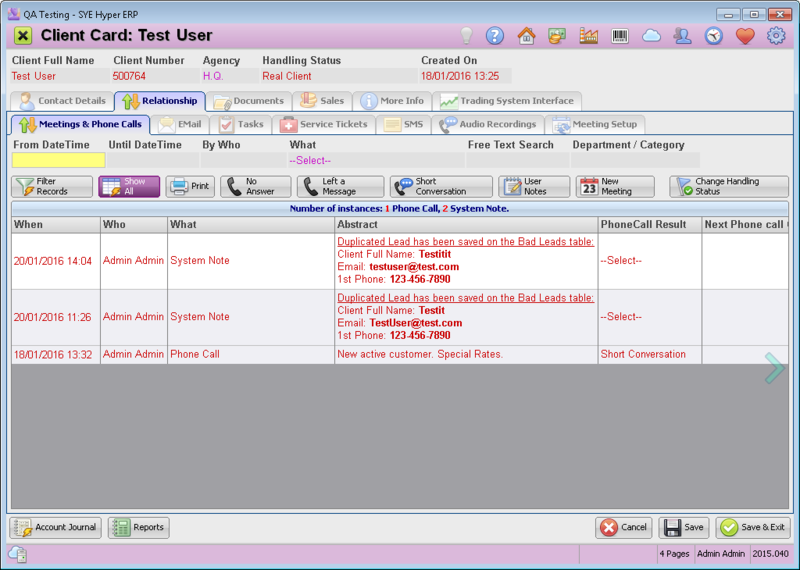 In the PhoneCall results the system will automatically choose "Left a Message". The system will ask the user to choose the timing for an auto reminder to call again. This timing will be automatically filled in the "Next PhoneCall On" field. These fields can be modified by the user. Short Conversation - A new PhoneCall record will be added. The user should fill in the "Abstract" field and choose "Short Conversation" / "Long Conversation" in the "PhoneCall Results" field. If an additional phonecall is required, fill in "Next Phone call On" and "Next Phone call By". Please note - If the "Next Phone call on" field is defined, a new alert record will be added to the Alerts List. 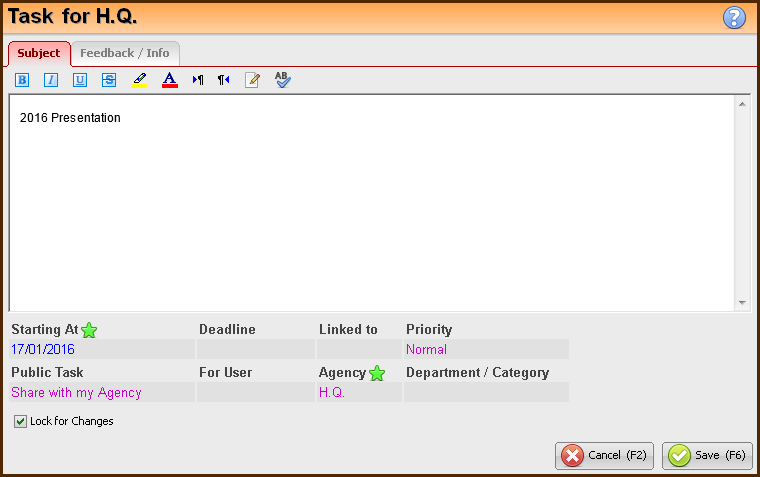 This alert will be displayed in the alerts list, until creating the next required relationship record for this client. The user can add notes to this table. Use the User Notes button and fill in the "Abstract" as well as the "Next Phone call" fields. 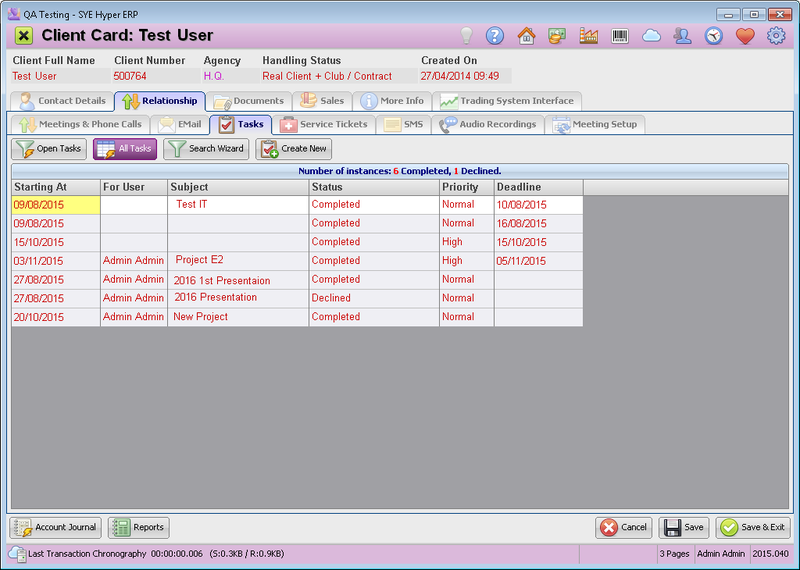 By using the New Meeting button, the user can set a new meeting with the Client / Supplier. This button will open the "New Meeting" window, to fill in the required details of the meeting and choose the attendees and recipients. For further information about meeting, Click here. Fictive Contact / Client Not Interested - This handling status is available for any client with a current status of "New" or "Follow Up + Meeting / P.Offer". When choosing this status, the user will be asked to write the reason for the new status. Please Note - Any client who's defined as "Fictive Contact", will be removed from the Clients list and will be added to the "Bad Leads" list. For any further information about the Bad Leads Click here. Problematic (Read Notes) - This status can be defined for a client with a current status of "Real Client" or "Real Client + Club / Contract". Please Note - the user must write a "Popup Serious Note" for this client card. Real Client + Club / Contract - This status is available for a "Problematic" Clients. Follow Up + Meeting / P.Offer - This status is available for any client that was defined as "Not Interested". Follow up - This statues is automatically given by the system after the first contact with the supplier. Real Supplier - This status manually defined by the user. In order to define this status, choose the "Set As Real Supplier" after approving this supplier in the organization. Problematic (Read Notes) - This status is available for a "Real Supplier", by choosing "Set as Problematic". 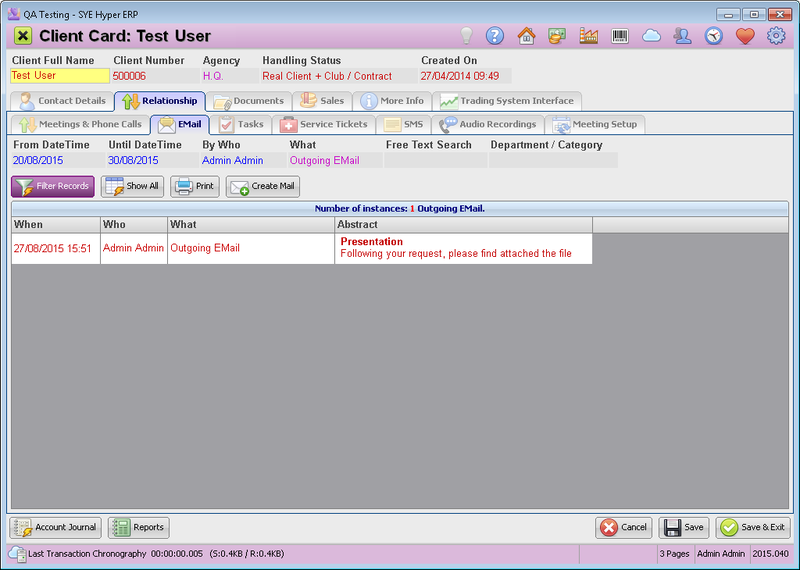 In order to change the Handling Status, the user must fill in the "abstract field". The "abstract" field can be modified for one hour after updating a new contact. A new contact record can be deleted from the table for 20 minutes. This tab displays all of the email correspondences between the organization and the Client / Supplier. 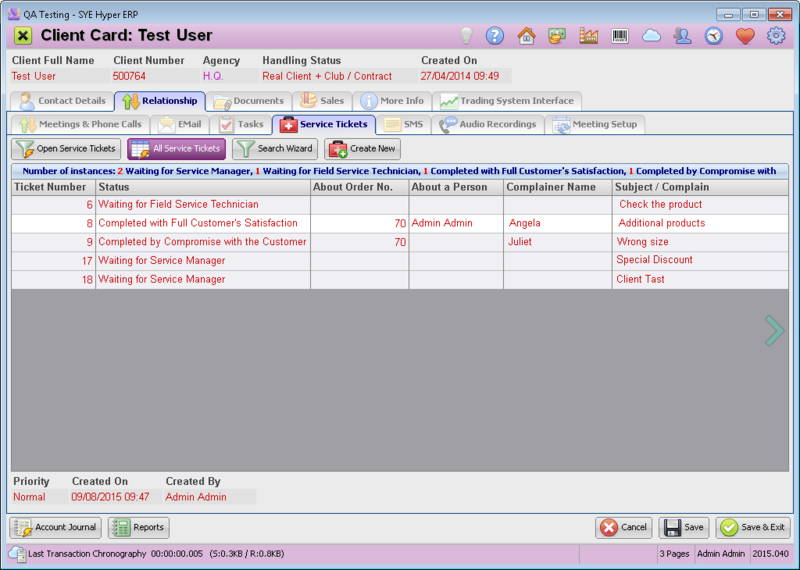 The searching fields at the top of this widow are used for filtering the Email records according to the required definitions. Please note - When choosing the "Completed" or "Declined" status the system will close the task. Service tickets are queries / requests / complaints etc. refer to a service or a product that was supplied by the organization, and requires a treatment or a reference. 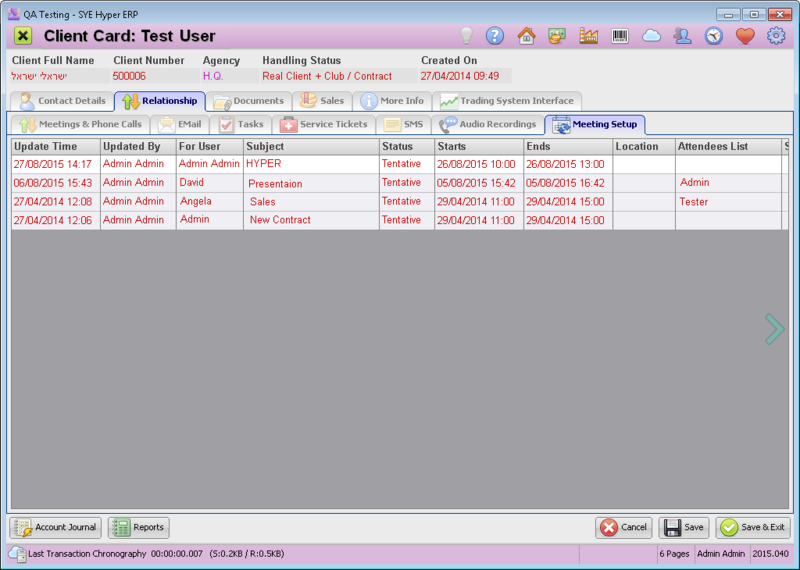 This tab allows to create a new service ticket and display the list of service tickets related to this Client / Supplier card. This list of Service Tickets is also used for follow up, and to update the status of the service ticket, according to its relevant representatives activity and the customers satisfaction. Use the Create New button, in order to create a new Service Ticket. For further information about the service ticket, click here. The position of the playback on the time line. This table contains all of the meeting records with this Client / Supplier. Double click on a meeting to open its card. For further information about creating a new meeting, Click here. Changing Handling Status to Fictive and update the "Bad Client Leads" table. When changing the handling status of a client to Fictive, only the values of the "Bad Client Leads" table will be saved. Therefore, if there are any other important information fields in the Client table (hyp_Clients), that are not defined in the "Bad Client Leads" table, the system admin should define these fields in advanced, during the assimilation of Hyper. Please Note - All of the values from the fields that are not defined in the "Bad Client Leads" table will be deleted.